Last month, Google CEO Eric Schmidt noted that Google was activating 200,000 Android devices a day. Obviously, that’s a massive number. Today during the Apple event in San Francisco, Steve Jobs took the chance to one up him — then take a shot at Google. 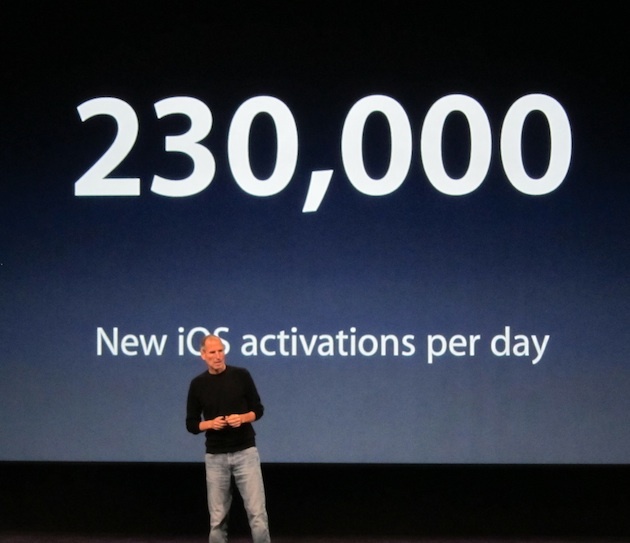 Apple is activating 230,000 iOS devices a day, Jobs says. He made a thinly veiled reference to the Android numbers, and said “we think some of our friends are counting upgrades in their numbers.” Jobs said Apple is not doing that — if they were, the numbers would be much higher. The way he phrased it, you almost have to assume Jobs is including iPod touches in those numbers — but you don’t activate iPod touches (unless he means activating the iTunes/App Store on the device). So perhaps he just means iPhones and 3G iPads. Either way, I fully expect Google to announce they’re activating 250,000 Android units — like, tomorrow. I’m only half-kidding. Jobs also noted that 120 million iOS devices have shipped so far. And said that 200 apps were being downloaded every second from the App Store. The Android activation numbers do not include upgrades and are, in fact, only a portion of the Android devices in the market since we only include devices that have Google services. I have a feeling this is going to be an ongoing theme between the two.